Endpoints can be another virtual machine (VM), a fully qualified domain name (FQDN), a uniform resource identifier (URI), or IPv4 address. The connection monitor capability monitors communication at a regular interval and informs you of reachability, latency, and network topology changes between the VM and the endpoint. For example, you might have a web server VM that communicates with a database server VM. Someone in your organization may, unknown to you, apply a custom route or network security rule to the web server or database server VM or subnet. If an endpoint becomes unreachable, connection troubleshoot informs you of the reason. Potential reasons are a DNS name resolution problem, the CPU, memory, or firewall within the operating system of a VM, or the hop type of a custom route, or security rule for the VM or subnet of the outbound connection. Learn more about security rules and route hop types in Azure. Connection monitor also provides the minimum, average, and maximum latency observed over time. After learning the latency for a connection, you may find that you're able to decrease the latency by moving your Azure resources to different Azure regions. Learn more about determining relative latencies between Azure regions and internet service providers and how to monitor communication between a VM and an endpoint with connection monitor. If you'd rather test a connection at a point in time, rather than monitor the connection over time, like you do with connection monitor, use the connection troubleshoot capability. Network performance monitor is a cloud-based hybrid network monitoring solution that helps you monitor network performance between various points in your network infrastructure. It also helps you monitor network connectivity to service and application endpoints and monitor the performance of Azure ExpressRoute. Network performance monitor detects network issues like traffic blackholing, routing errors, and issues that conventional network monitoring methods aren't able to detect. The solution generates alerts and notifies you when a threshold is breached for a network link. It also ensures timely detection of network performance issues and localizes the source of the problem to a particular network segment or device. Learn more about network performance monitor. You can download an editable version of the picture in svg format. Learn more about topology view. When you deploy a VM, Azure applies several default security rules to the VM that allow or deny traffic to or from the VM. You might override Azure's default rules, or create additional rules. At some point, a VM may become unable to communicate with other resources, because of a security rule. The IP flow verify capability enables you to specify a source and destination IPv4 address, port, protocol (TCP or UDP), and traffic direction (inbound or outbound). IP flow verify then tests the communication and informs you if the connection succeeds or fails. If the connection fails, IP flow verify tells you which security rule allowed or denied the communication, so that you can resolve the problem. Learn more about IP flow verify by completing the Diagnose a virtual machine network traffic filter problem tutorial. When you create a virtual network, Azure creates several default outbound routes for network traffic. The outbound traffic from all resources, such as VMs, deployed in a virtual network, are routed based on Azure's default routes. You might override Azure's default routes, or create additional routes. You may find that a VM can no longer communicate with other resources because of a specific route. The next hop capability enables you to specify a source and destination IPv4 address. Next hop then tests the communication and informs you what type of next hop is used to route the traffic. You can then remove, change, or add a route, to resolve a routing problem. Learn more about the next hop capability. The connection troubleshoot capability enables you to test a connection between a VM and another VM, an FQDN, a URI, or an IPv4 address. The test returns similar information returned when using the connection monitor capability, but tests the connection at a point in time, rather than monitoring it over time, as connection monitor does. Learn more about how to troubleshoot connections using connection-troubleshoot. Advanced filtering options and fine-tuned controls, such as the ability to set time and size limitations, provide versatility. The capture can be stored in Azure Storage, on the VM's disk, or both. You can then analyze the capture file using several standard network capture analysis tools. Learn more about packet capture. Virtual network gateways provide connectivity between on-premises resources and Azure virtual networks. Monitoring gateways and their connections are critical to ensuring communication is not broken. The VPN diagnostics capability provides the ability to diagnose gateways and connections. VPN diagnostics diagnoses the health of the gateway, or gateway connection, and informs you whether a gateway and gateway connections, are available. If the gateway or connection is not available, VPN diagnostics tells you why, so you can resolve the problem. Learn more about VPN diagnostics by completing the Diagnose a communication problem between networks tutorial. You can query Network Watcher for latency information between Azure regions and across internet service providers. When you know latencies between Azure regions and across Internet service providers, you can deploy Azure resources to optimize network response time. Learn more about relative latencies. The effective security rules for a network interface are a combination of all security rules applied to the network interface, and the subnet the network interface is in. The security group view capability shows you all security rules applied to the network interface, the subnet the network interface is in, and the aggregate of both. With an understanding of which rules are applied to a network interface, you can add, remove, or change rules, if they're allowing or denying traffic that you want to change. Learn more about security group view. The information is helpful when planning future resource deployments. Learn more about NSG flow logs by completing the Log network traffic to and from a virtual machine tutorial and how to implement traffic analytics. You can enable diagnostic logging for Azure networking resources such as network security groups, public IP addresses, load balancers, virtual network gateways, and application gateways. The Diagnostic logs capability provides a single interface to enable and disable network resource diagnostic logs for any existing network resource that generates a diagnostic log. You can view diagnostic logs using tools such as Microsoft Power BI and Azure Monitor logs. 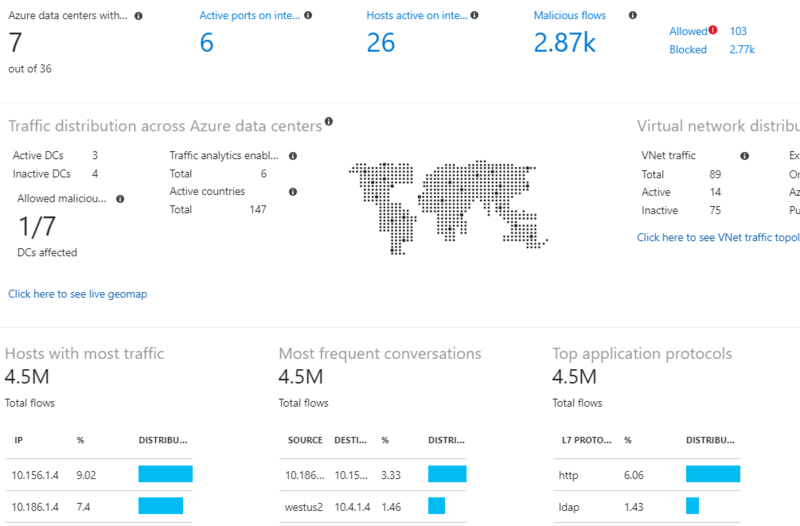 To learn more about analyzing Azure network diagnostic logs, see Azure network solutions in Azure Monitor logs. When you create or update a virtual network in your subscription, Network Watcher will be enabled automatically in your Virtual Network's region. There is no impact to your resources or associated charge for automatically enabling Network Watcher. For more information, see Network Watcher create. You now have an overview of Azure Network Watcher. To get started using Network Watcher, diagnose a common communication problem to and from a virtual machine using IP flow verify. To learn how, see the Diagnose a virtual machine network traffic filter problem quickstart.